In Botswana, a Southern African country occupied by a plateau that has an average altitude of around 1,000 meters (3,300 feet), the climate is sub-tropical, arid or semi-arid depending on area. The winter, from May to August, is dry and sunny, mild during the day but cold at night, especially in the center and south. The summer, from November to March, is hot and moderately rainy because of thunderstorms that break out in the afternoon or evening; therefore, there's plenty of sunshine even in this season, especially in the morning. In spring, in September and October, the heat is often intense especially in the north, however, hot days are possible throughout the country from September to April. In Botswana, there are several parks and nature reserves that are home to plant and animal species of the savannah, which are still little known but of great interest. Being in the Southern Hemisphere, the country has reversed seasons in comparison with the Northern Hemisphere. The driest areas are the south-west, where the Kalahari desert is found and precipitation drops below 300 millimeters (12 inches) per year, and the far east, in the valley of the Limpopo, where it goes below 400 mm (16 in) per year. The wettest areas, where more than 500 mm (20 in) of rain fall per year, are the north and the south-east, where Gaborone is located. In general, rainfall in the warm season is not very abundant, but during some years, it can be more abundant than usual, when the country is reached by moist air masses from Congo, or because of the remains of cyclones (see below). The average daily temperature of the coldest months, June and July, is around 11/12 °C (52/54 °F) in the south and 18 °C (64 °F) in the north; already in August, the temperature starts to increase. In summer, the temperatures are more uniform across the country, in fact, they range between 25 °C and 27 °C (77 °F and 81 °F), depending on latitude but also on altitude which, however, is fairly uniform as well. The hottest months are December and January in the center-south, while in the north, the hottest days occur in October and November, before the rains that are able to lower the temperature a bit: in this period, the daytime temperature is normally around 35 °C (95 °F), but can even reach 40 °C (104 °F). In the south-west, we find the Kalahari desert. In Tshabong, located in the far south-west, near the Gemsbok National Park, which is part of the Kgalagadi Transfrontier Park, in winter, nights are cold but days are mild, so there is a remarkable temperature range, while summer is definitely hot. Here are the average temperatures of Tshabong. In this southern area, the rains are scarce, in fact, they amount to about 300 mm (12 in) per year. Here is the average rainfall. In the arid southwest, the sun shines all year round. Here are the average sunshine hours per day. The capital, Gaborone, is located in the south-east, a short distance from the border with South Africa, and at 1,000 meters (3,300 feet) above sea level like most of the country. From October to March, the maximum temperatures are around 30 °C (86 °F) or slightly above, but moisture is higher from December to March, at the height of the rainy season. Sometimes, the temperature can reach 36/40 °C (97/104 °F) from September to April. In winter, from May to August, the sun shines and it almost never rains; daytime temperatures are pleasant, while they are cold at night and get close to freezing (0 °C or 32 °F). Therefore, in winter, the temperature range between day and night is noticeable here as well. Here are the average temperatures. In a typical year, 590 mm (23 in) of rain fall, of which 100 mm (4 in) fall per month from December to February. Here is the average precipitation. In Gaborone, the sun shines all year round, however, because of afternoon thunderstorms, the sunshine duration decreases a little in the rainy season. Sometimes, however, on winter nights, it can freeze even in the north-west of the country, on the edge of the Okavango Delta, the river that gets lost in a vast marshy area without having access to the sea. Here are the average temperatures of the village of Maun, located at 950 meters (3,100 ft) above sea level, south-east of the Okavango Delta. Here, the rainfall amounts to 450 mm (18 in) per year. Here is the average rainfall. Here, too, the sun shines all year round, but especially in the dry winter season. To the south-east of the Okavango delta and of Maun, we find the Makgadikgadi Pan, a group of dry salt lakes that during the rainy season receive the waters of the Boteti River (which carries the waters of the same Okavango delta) and the Nata River. 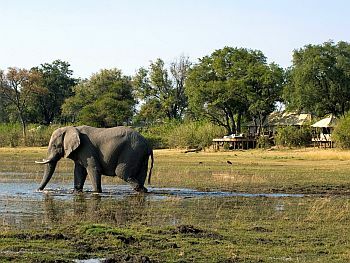 The area is protected in the two neighboring national parks, Nxai Pan and Makgadikgadi Pan. In the far north, winter is milder, in fact, the maximum temperature is around 24/26 °C (75/79 °F) and the minimum around 8/10 °C (46/50 °F). Moreover, as mentioned, the hottest period in the north goes from September to November, while in summer, the temperature slightly decreases because of the prevalence of more humid air masses of tropical origin. Here are the average temperatures of the northern town of Kasane, in the Chobe National Park, near the border with Namibia (Caprivi Strip), Zambia, and Zimbabwe. In this northernmost area, which is the rainiest of the country, rainfall exceeds 600 mm (23.5 in) per year, though the rains are concentrated, as usual, in summer. Here is the average rainfall. In the northernmost area, the sun regularly shines in the long dry season, while in the rainy period, the sunshine hours decrease a little more than in the rest of the country. Beyond the border, about 70 km (45 mi) to the east, we find the Victoria Falls. Occasionally, Botswana can be affected by tropical cyclones, which originate in the Indian Ocean, and after passing over Mozambique, can reach the eastern regions of the country. Typically, they lose strength when they penetrate the mainland, but they are still able to bring a good amount of rain, as happened with Cyclone Japhet in early March 2003 and Cyclone Dineo in mid-February 2017. The cyclone season runs from mid-November to May, but they are most likely from late December to mid-April. The best time to visit Botswana is the austral winter, from May to August: the sky is clear, the air is dry, it's warm during the day, and the animals of the savanna are easy to spot because they are concentrated in the few water puddles left. Certainly, you must take into account a bit of cold at night, especially in the center-south, even with possible slight frosts. Given the remarkable daily temperature range, it is necessary to dress in layers. If you want to go in the austral summer, for example at Christmas, you will have to reckon with rains and thunderstorms, especially in the north and in the south-east, and with the heat during the day, especially in the south and in the Kalahari. In September and October, before the arrival of the rains, the heat is intense especially in the north, but sometimes also in the rest of the country: those who are sensitive to cold and do not suffer from the heat can choose this period. In winter (June to August): dress in layers and bring spring/autumn clothes, light for the day, as well as a sweater, a warm jacket and a hat for the evening. In summer (December to February): bring light clothes for the day, a sun hat, a sweatshirt and a spring jacket for the evening, and a light raincoat or umbrella.